The two candidates vying for the 35th District State Assembly seat are sharply divided on a host of local, state, and national issues. Incumbent Assemblymember Jordan Cunningham (R-San Luis Obispo) and his opponent, Democrat Bill Ostrander, answered questions on a variety of topics at a Sept. 24 forum in SLO. New Times hosted the forum in partnership with the Home Builders Association of the Central Coast and the SLO Chamber of Commerce. RACE FOR THE 35TH DISTRICT Incumbent Assemblyman Jordan Cunningham and his challenger, Bill Ostrander, shared their views on education, transportation, immigration, and other issues at a Sept. 24 forum. The two candidates are on opposite sides of several issues, including Proposition 6, a statewide ballot measure to repeal a gas tax increase passed by state legislators to fund road repair projects. Ostrander, an activist and actor, vocally opposed the measure, arguing that it would eliminate funding for crucial road projects in the 35th District, which includes SLO County and Northern Santa Barbara County. "For us to cut that off would be cutting off our nose to spite our face," Ostrander said. Cunningham, who voted against the gas tax increase, supported the proposition. Cunningham characterized the increase as a burden on commuters, and chastised the state for diverting gas tax and vehicle fee revenues away from road repair projects. 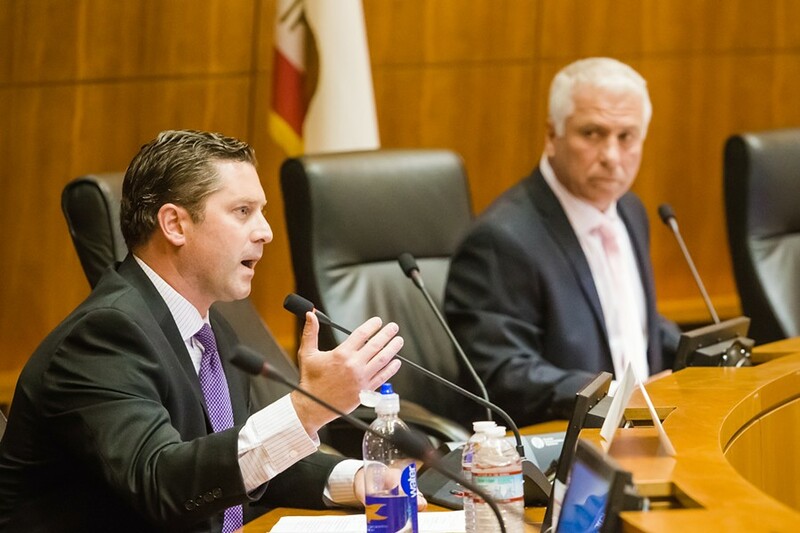 "If we just prioritized that money the way voters have told us to, and put our gas tax money and vehicle fee money into roads, we would not have to raise anybody's taxes," Cunningham said. The two candidates also sparred over Measure G, a local ballot measure that would ban fracking and new oil and gas drilling in SLO County. Cunningham declined to take a position but admitted he "had some reservations" about the measure. "The voters are going to decide," he said, later adding, "I probably won't [vote for the measure]." Ostrander was vocal in his support of the measure, and criticized Cunningham for not taking a position and accepting campaign contributions from oil and gas companies. "It reeks of the appearance of corruption," he said. Cunningham and Ostrander also took opposing sides on California's so-called sanctuary state law. Passed in 2017, the law limits state law enforcement's ability communicate with federal immigration authorities like ICE, and bars officers from holding and questioning individuals for immigration violations. Ostrander said he supported the bill, characterizing it as a "state rights issue" and a way to protect undocumented immigrants from an overly aggressive federal government. "Why do these people need to live in fear?" Ostrander said. "I think it's a xenophobic attitude in this country. It reminds me of the Japanese internment." Cunningham, who voted against the sanctuary state law, argued that it hampered local law enforcement's ability to do its job and jeopardized public safety. "On a state level, a policy like sanctuary state ... there's no way that is keeping the public safe," he said. "It's got nothing to do with xenophobia or any of that nonsense." The candidates also took questions on cannabis legalization, mental health, education, and housing. Their final remarks to the audience highlighted Ostrander's and Cunningham's divergent views on the role of government. Cunningham said that government wasn't always effective and efficient, and needed elected officials that would hold it accountable. "It takes some accountability in government. You deserve to have someone looking out for that," Cunningham said. "You need someone up there fighting for you to make sure that your state government isn't putting more on your back and who is going to help you." Ostrander, who espoused support for programs like single-payer health care during the forum, argued that government wasn't always the problem.